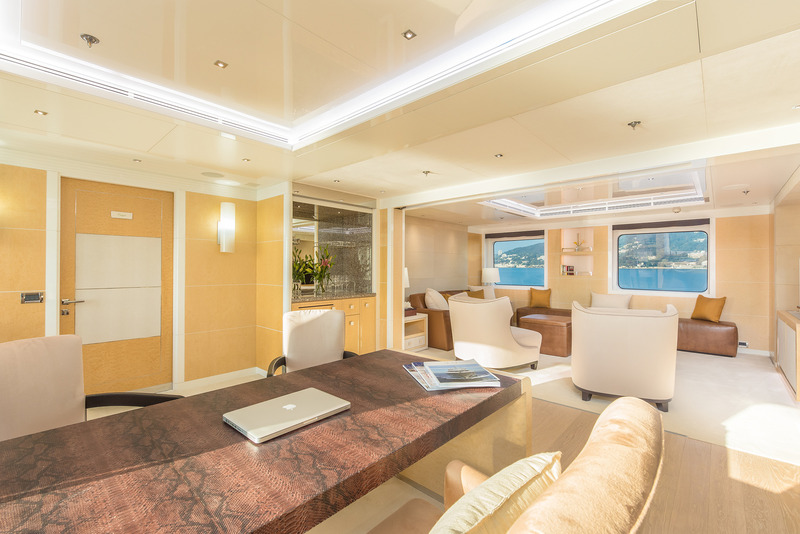 Luxury motor yacht JADE 959 was delivered by the Taiwan based shipyard Jade Yachts Inc. in 2014 and measures 51,8m (169,11ft) in length. 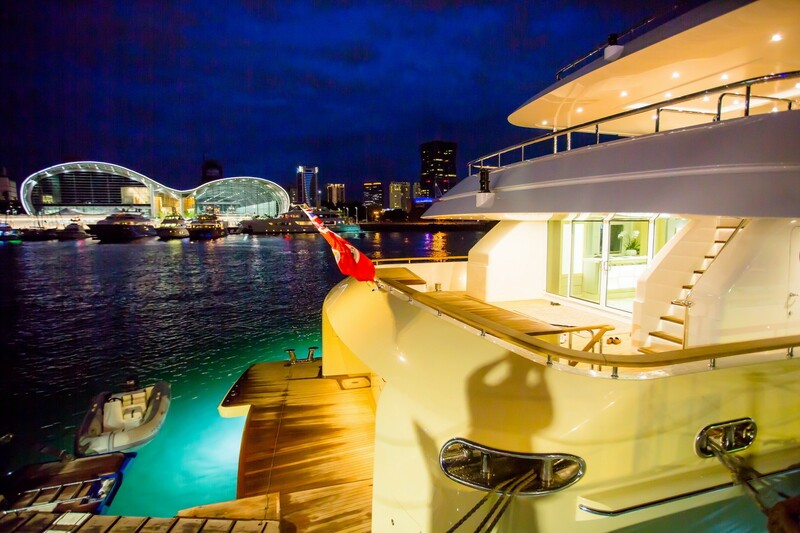 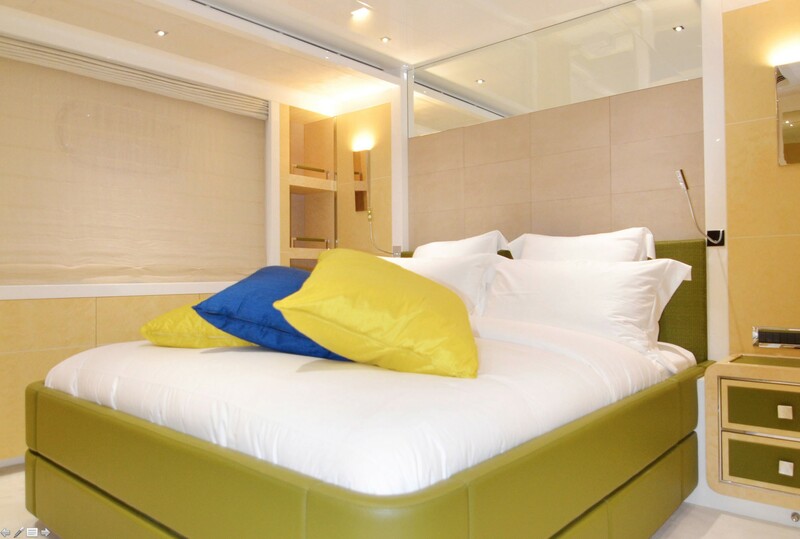 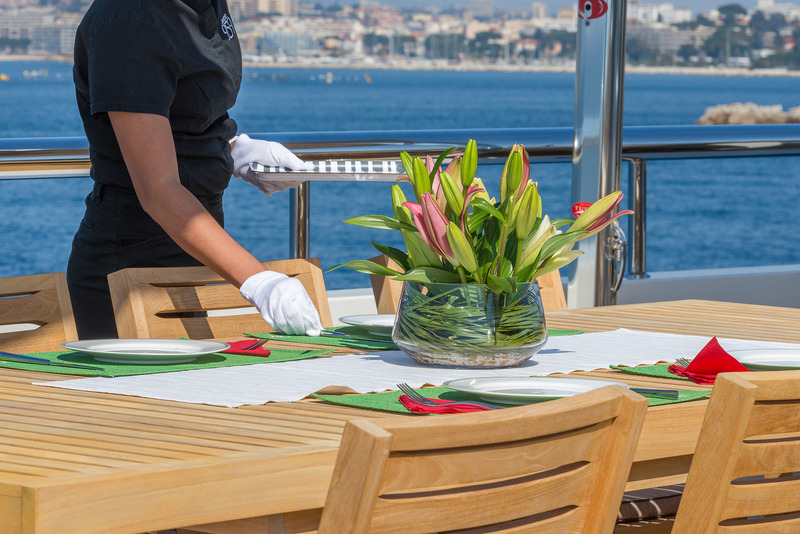 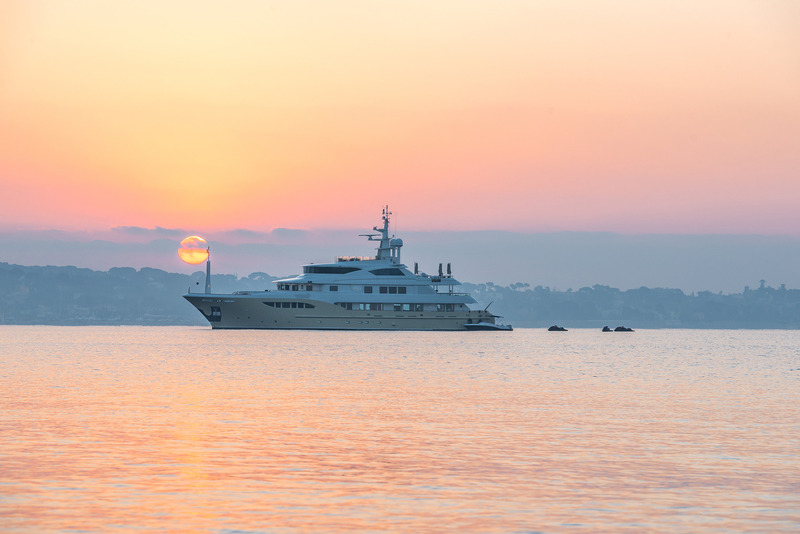 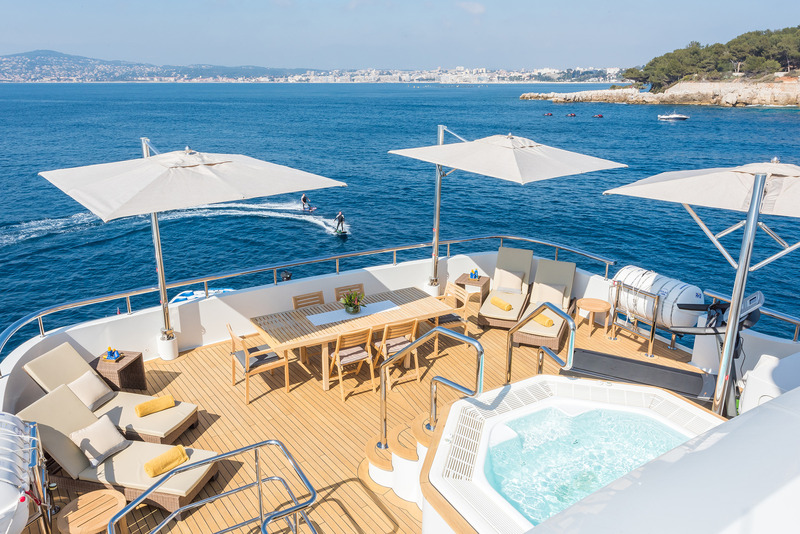 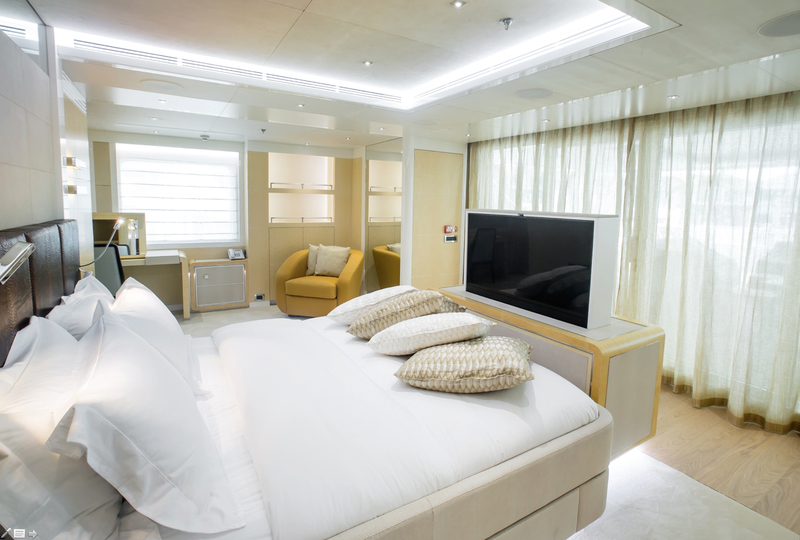 The vessel offers stylish accommodation for up to 12 charter guests, in 6 cabins. 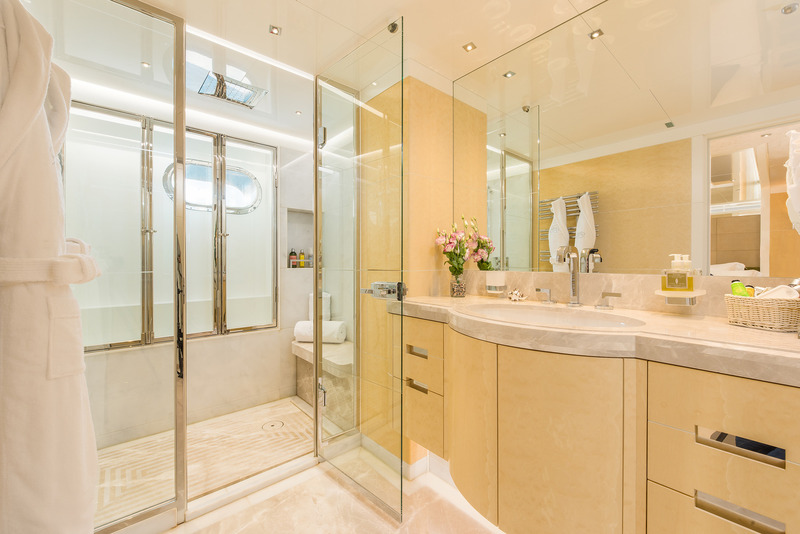 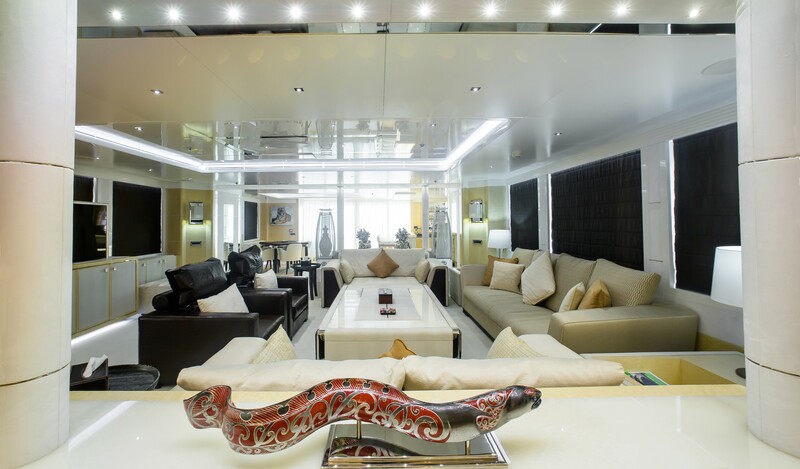 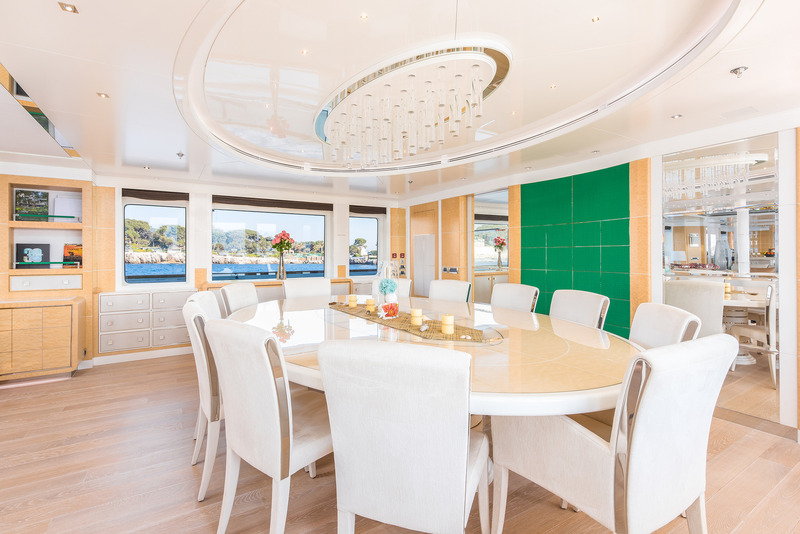 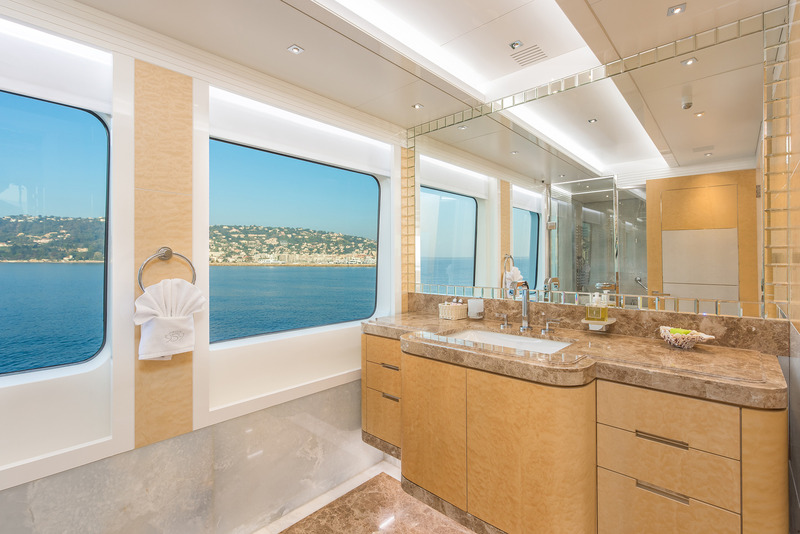 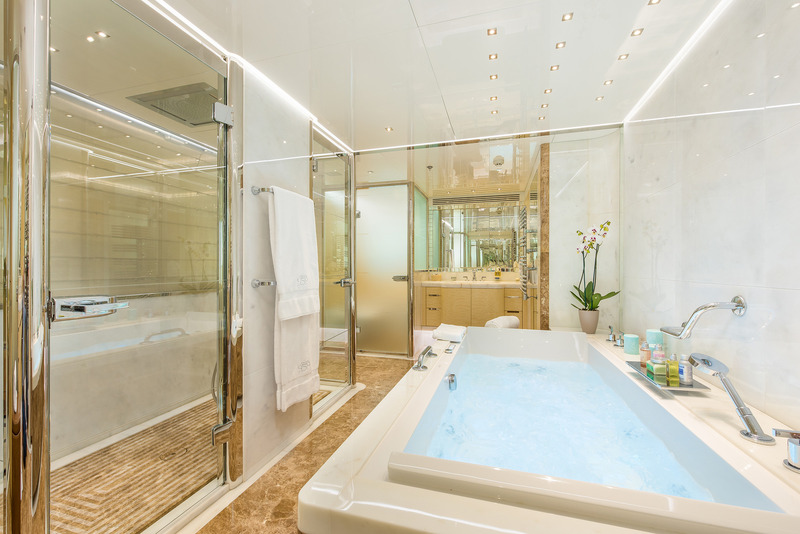 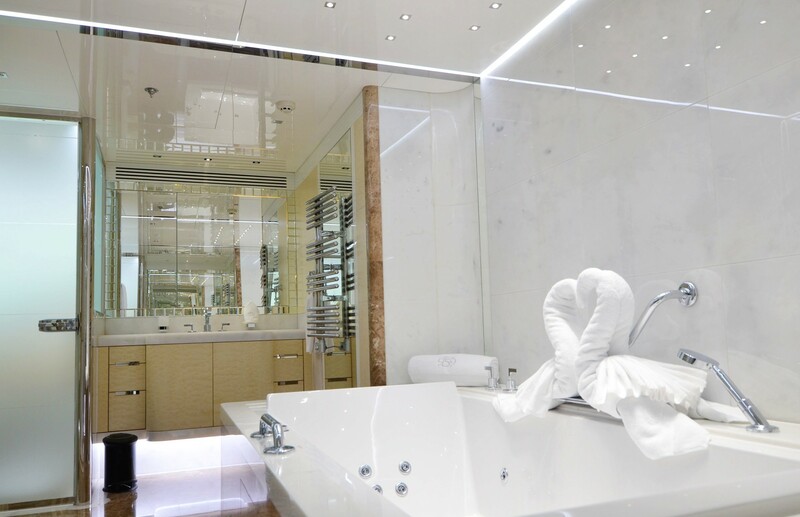 JADE 959 features interior design by Central Yachts, boasting a contemporary elegant finish and Fendi furnishings. 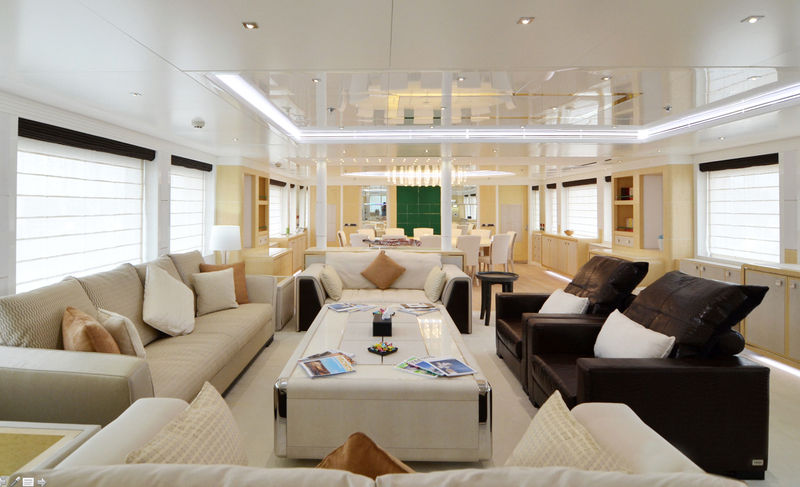 The main salon is open and airy, offering a generous lounge with plush leather sofas, occasional chairs and coffee table. 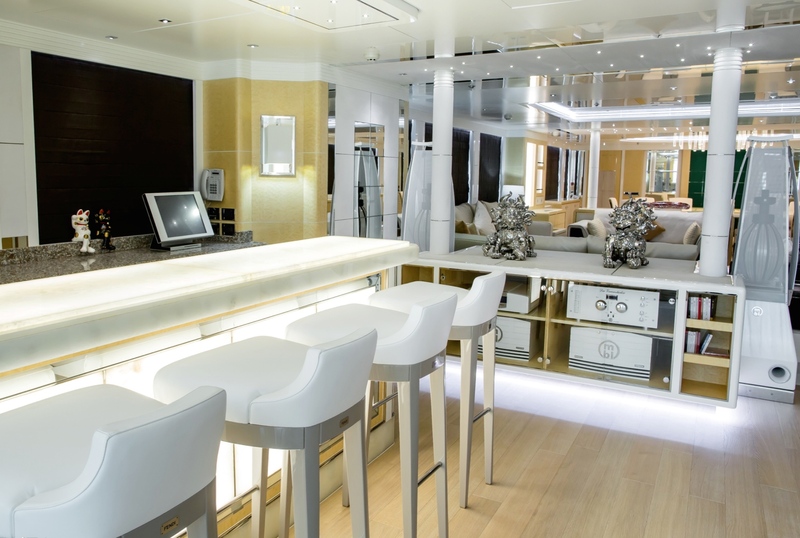 Forward of the salon is the formal dining table, easily seating all 12 guests, while aft of the salon is a complete wet bar, with stool seating and state of the art entertainment systems. 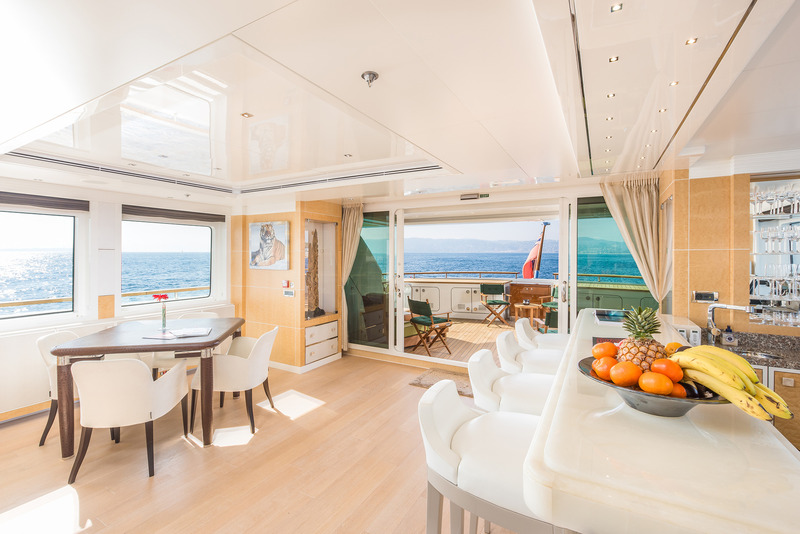 Forward on the main deck is the first master cabin, with a full beam layout, center lined king size bed and spacious lounge/study. 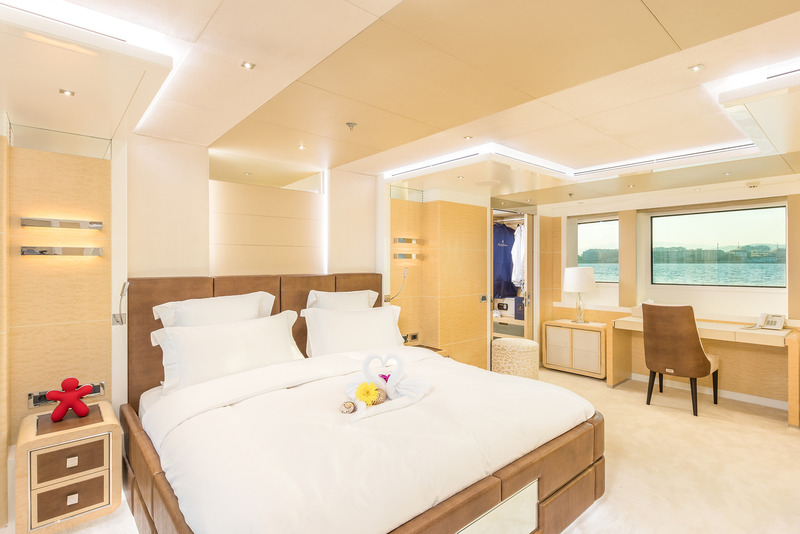 The upper deck offers the second master cabin, complete with a center lined king size bed, private study or optional large meeting lounge. 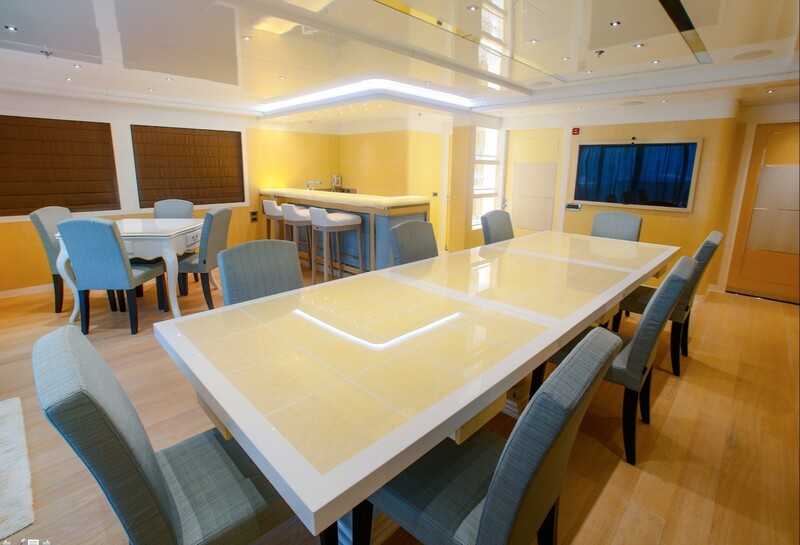 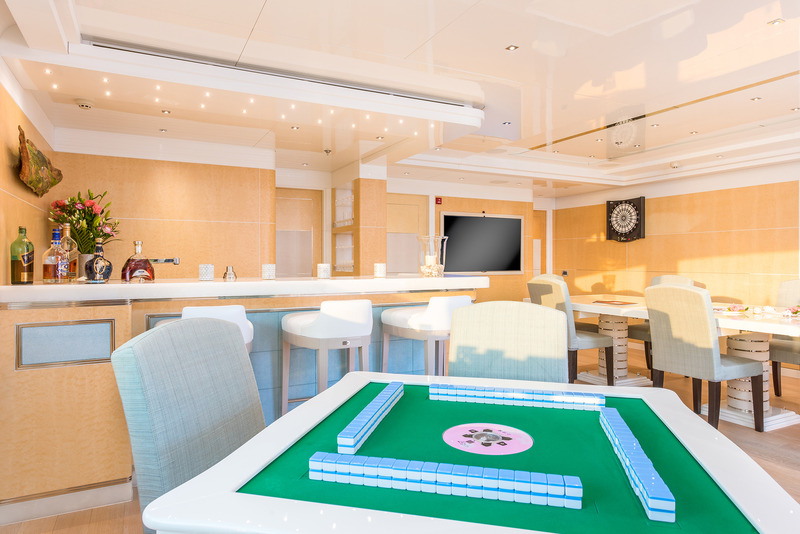 On the top deck are a social dining table and wet bar aft. 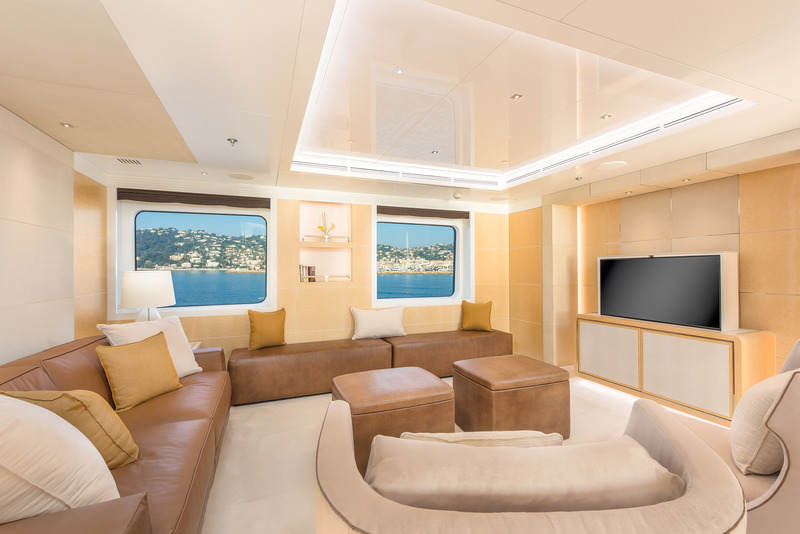 Forward a custom designed entertainment room features surrounding panoramic windows and ample lounging, ideal for movies and gaming. 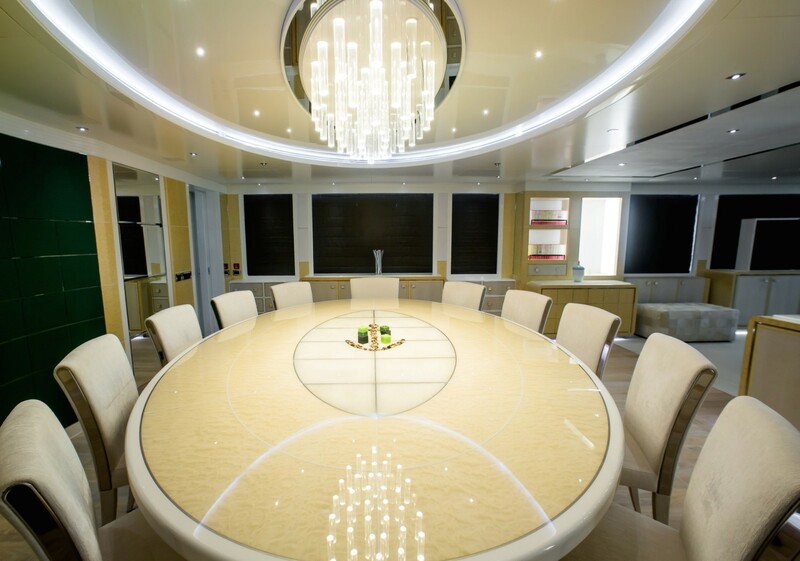 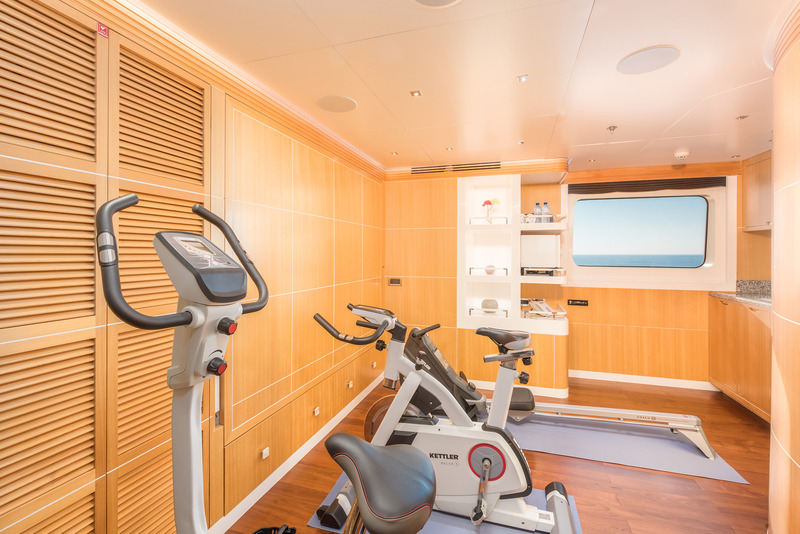 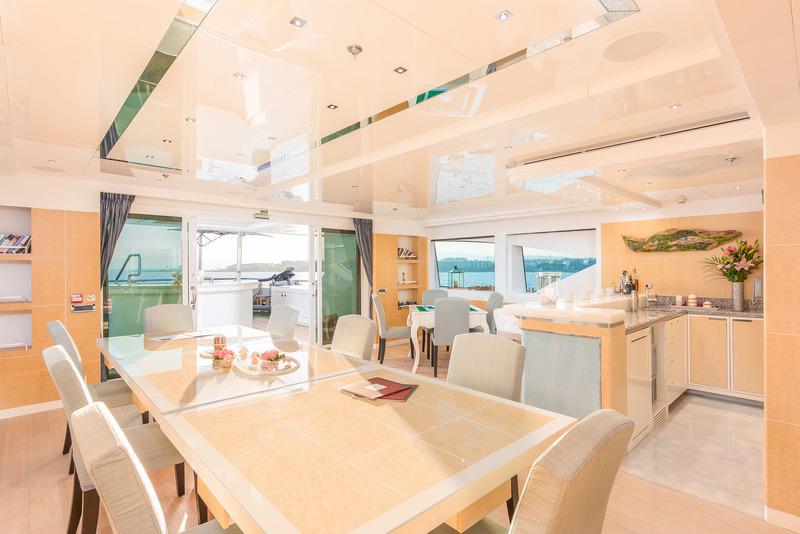 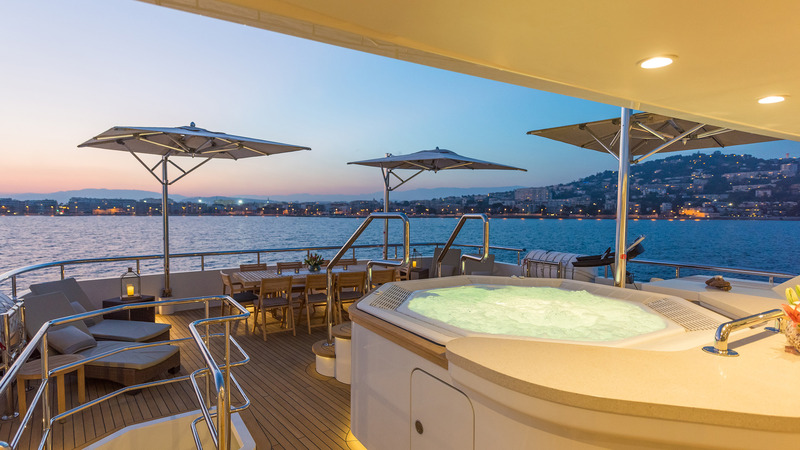 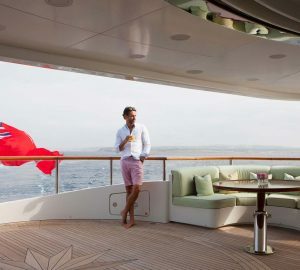 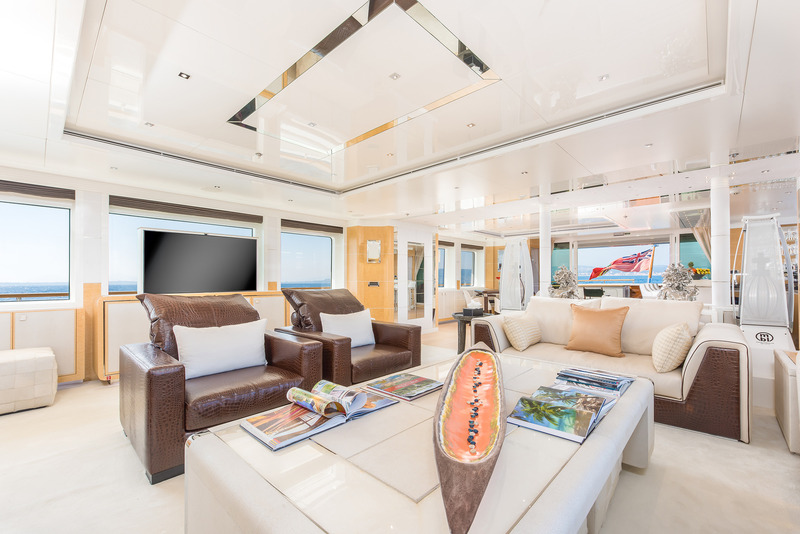 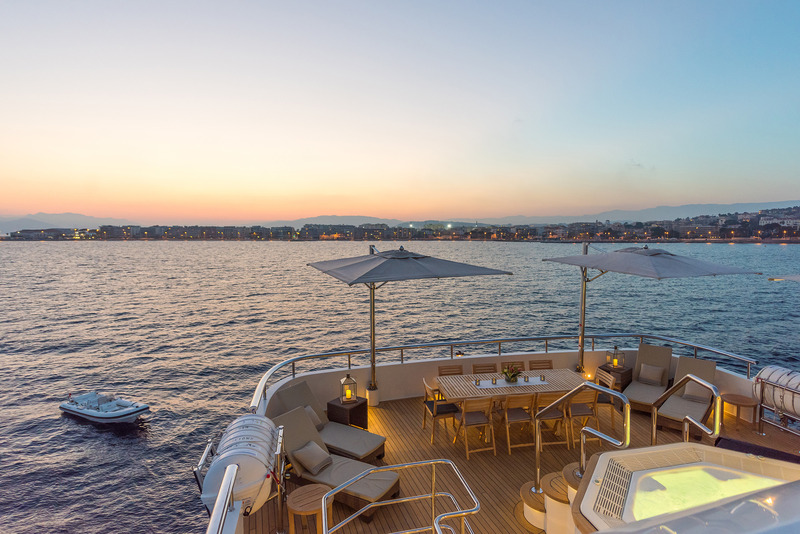 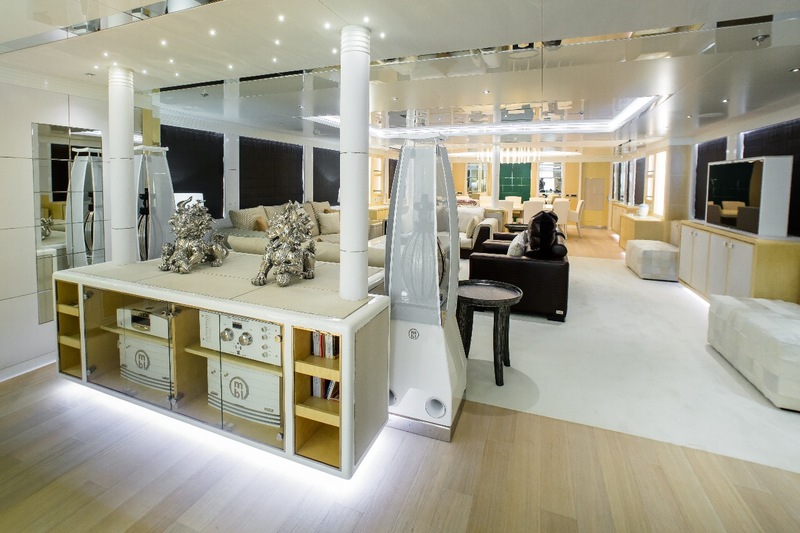 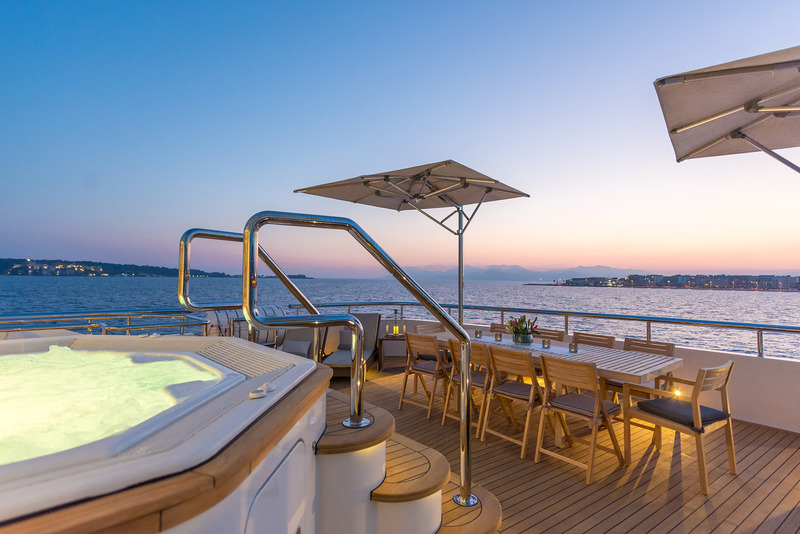 The lower deck of the superyacht JADE 959 offers 2 VIP cabins and 2 twin cabins. 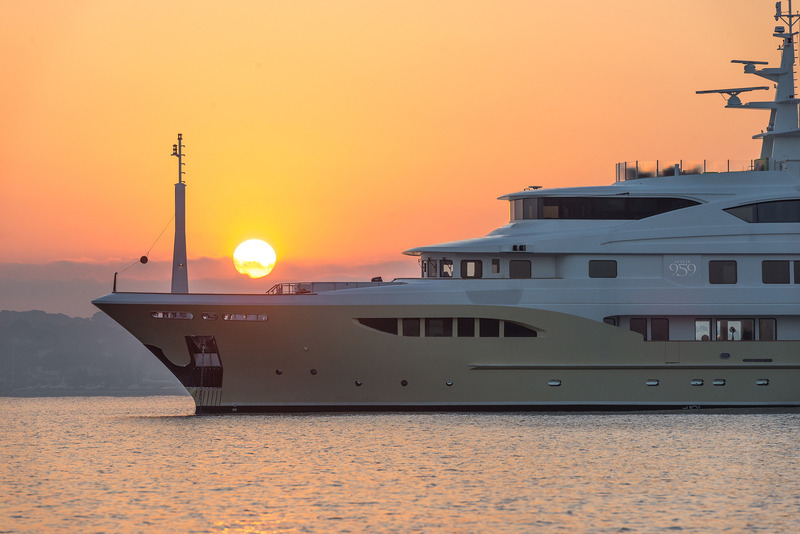 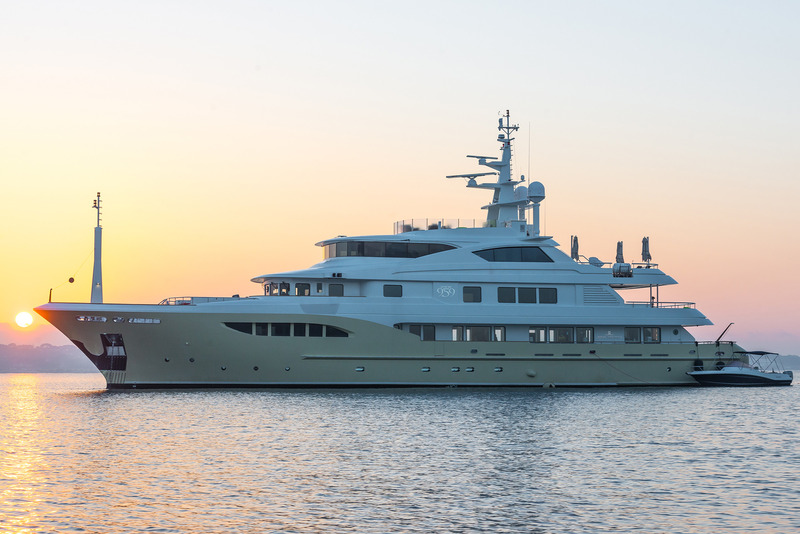 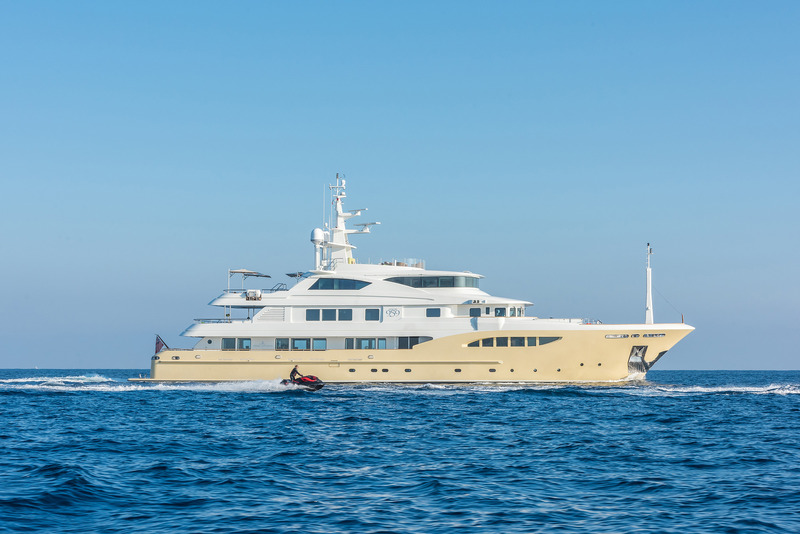 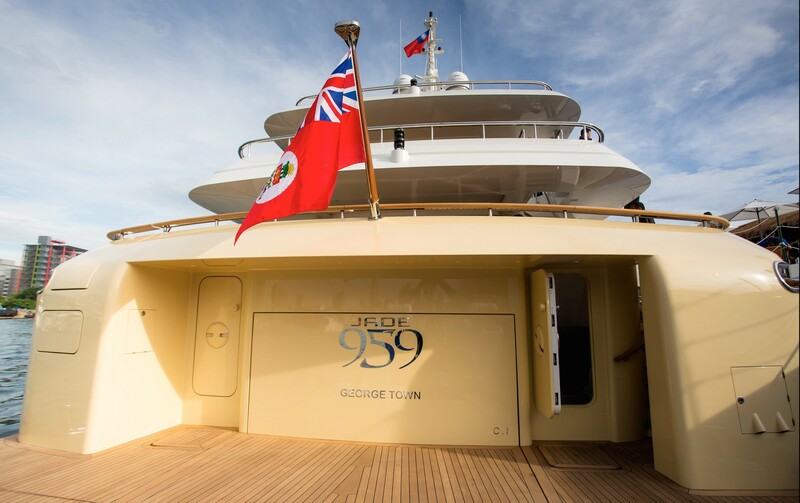 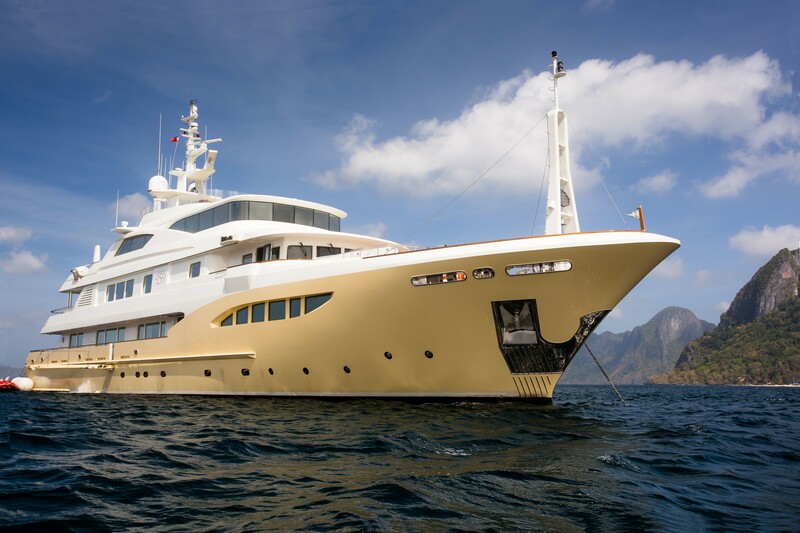 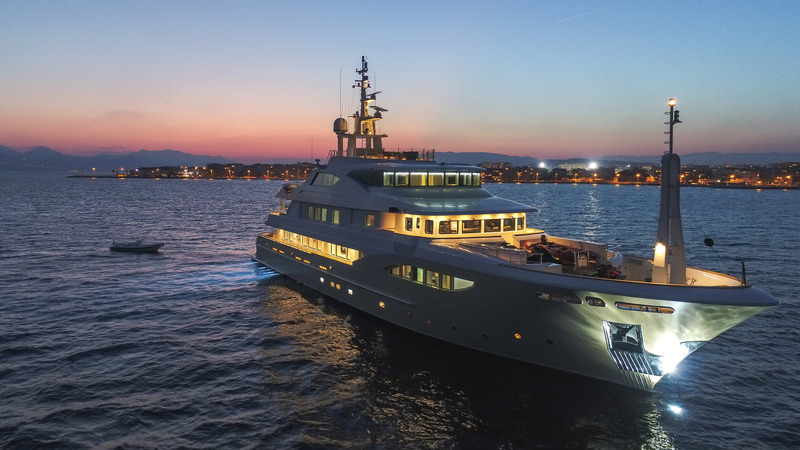 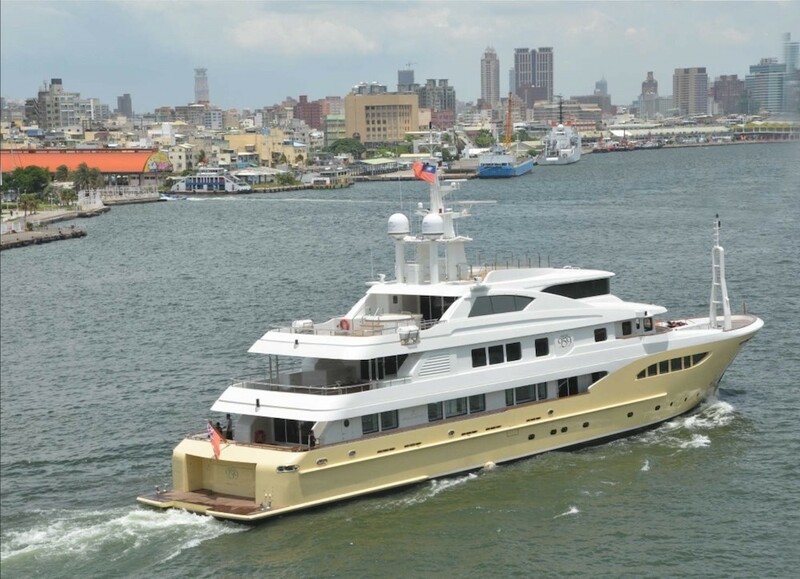 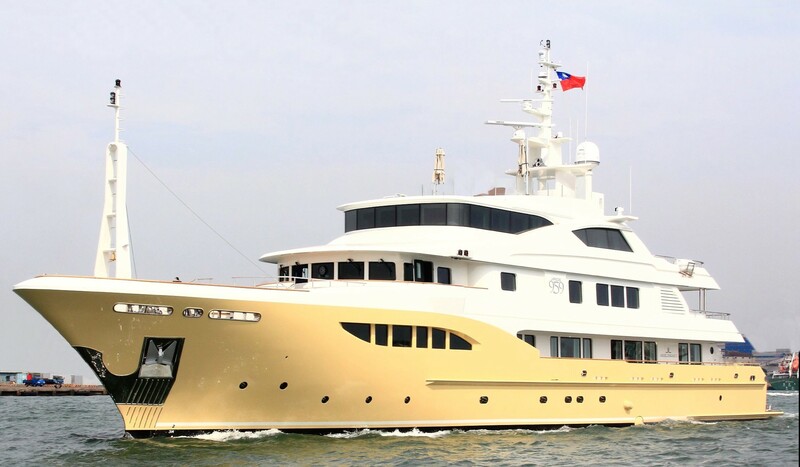 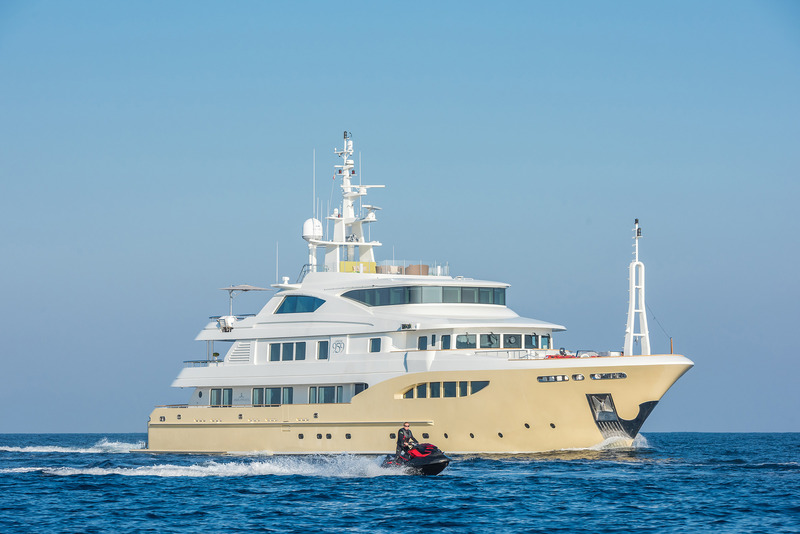 The exterior design of the yacht is by JC Espinosa, her golden yellow expedition styled hull boasts stunning lines, exuding power and seamanship. 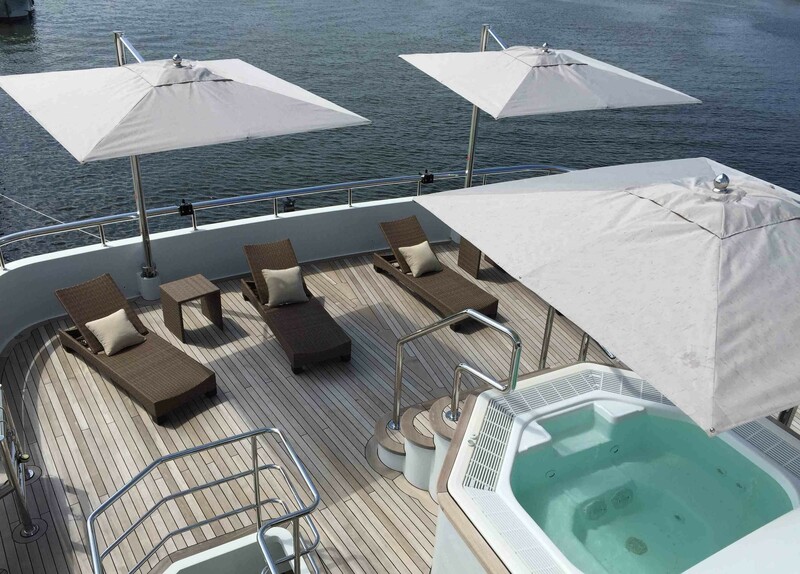 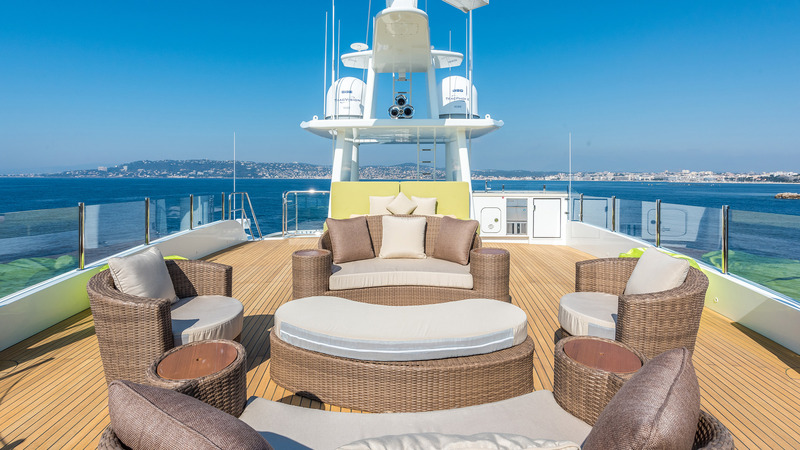 The main deck aft is shaded and offers an abundance of seating and relaxing options. 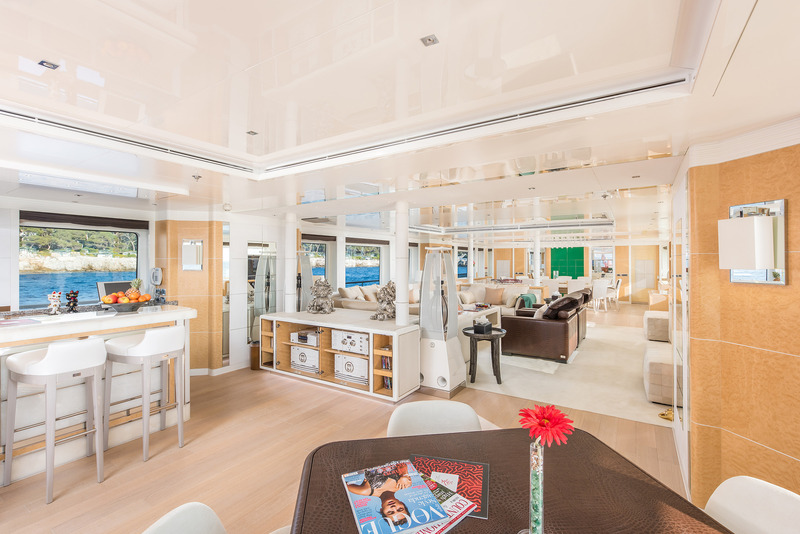 The upper aft deck is adjacent to the upper master cabin and has a generous exterior lounge and partial shade. 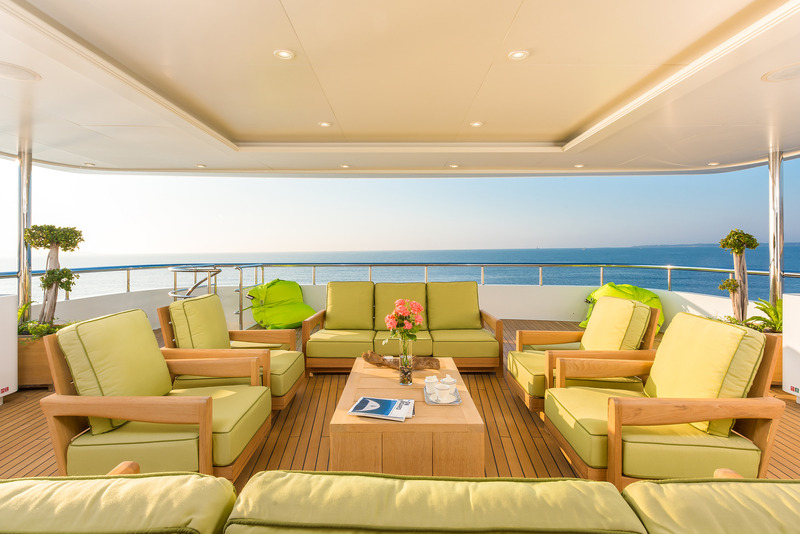 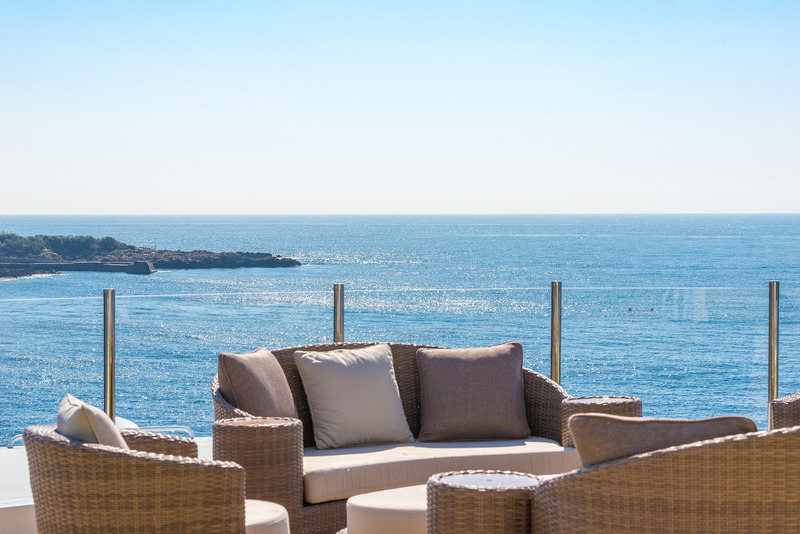 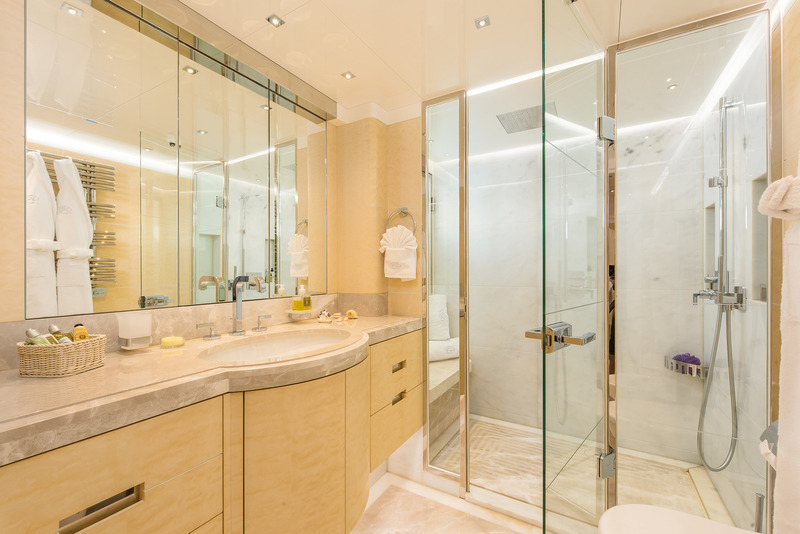 The top deck is perfect for soaking up the sun, boasting chaise lounges and a deluxe Jacuzzi tub. 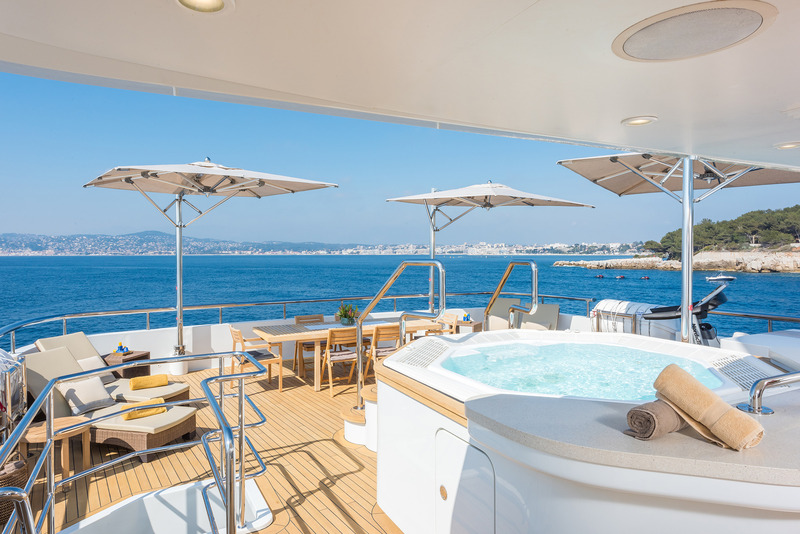 For the water enthusiasts, the extended swim platform on the stern allows effortless access to the fabulous choice of water toys on offer. 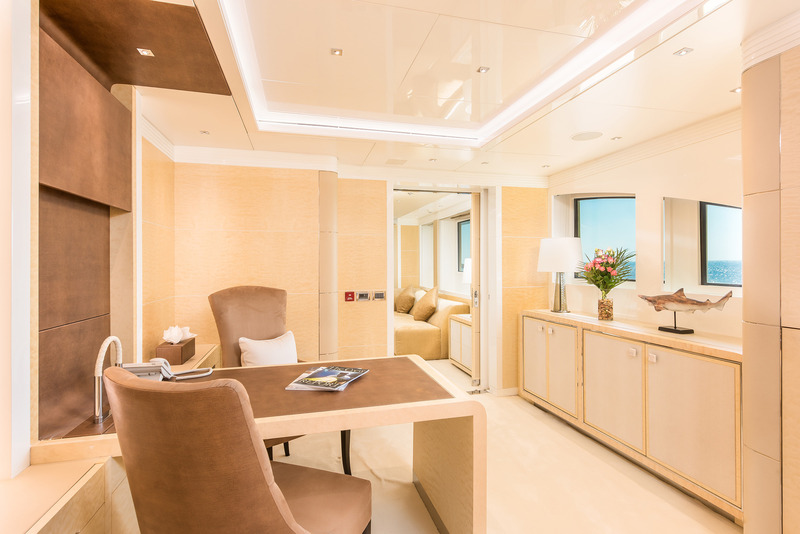 Powered by 2 x MTU 2,682hp engines, JADE 959 cruises at 11 knots and can reach top speeds of 16 knots. 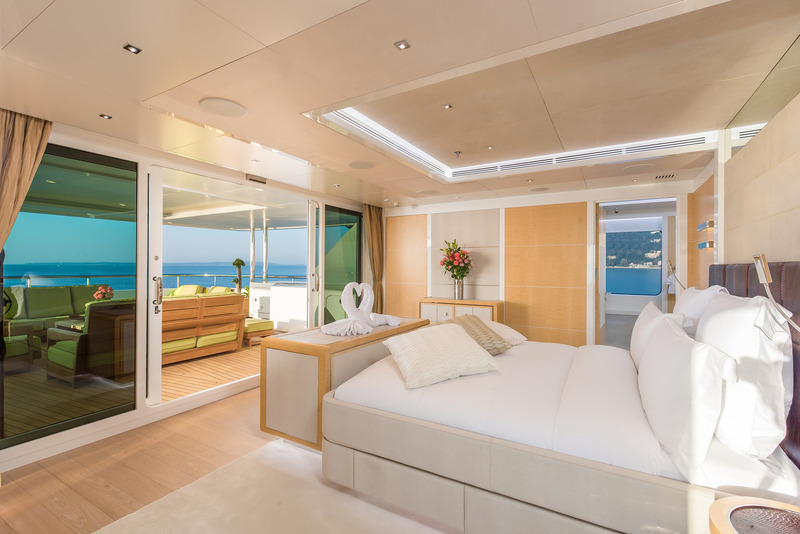 Luxury motor yacht JADE 959 accommodates up to 12 charter guests, in 6 well-appointed cabins. 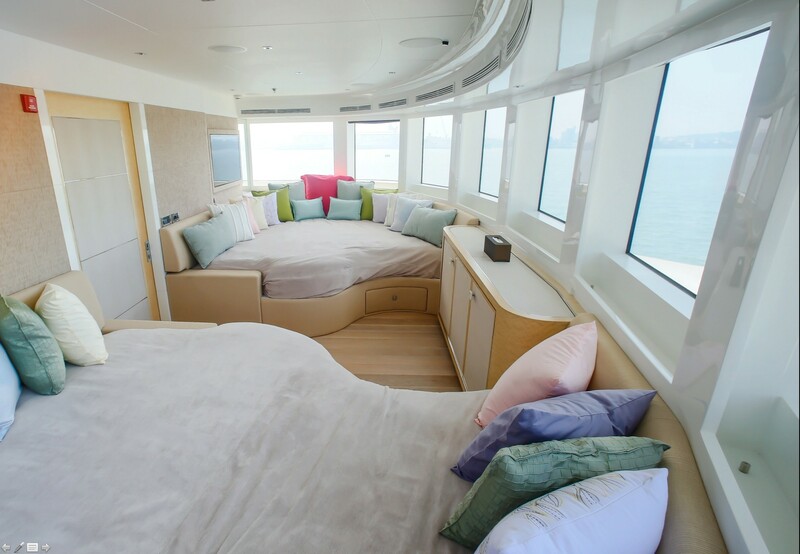 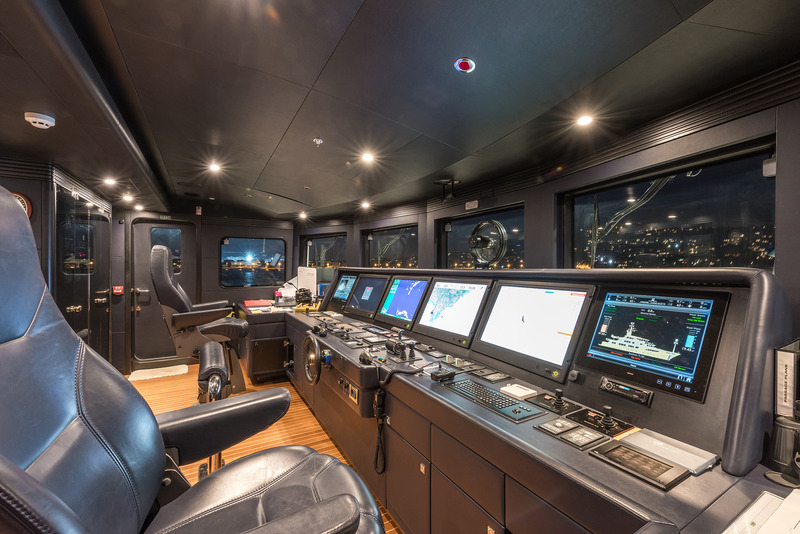 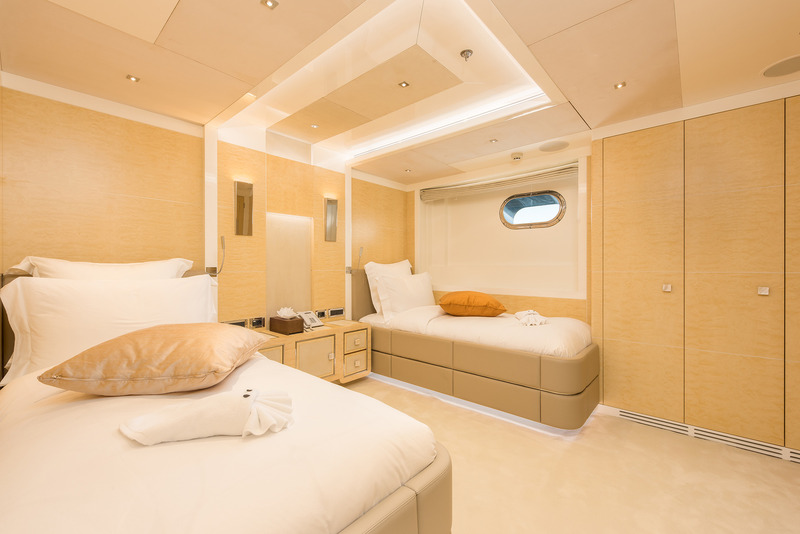 On the main deck forward of the salon, is the first full beam master cabin, with private study and center lined king size bed. 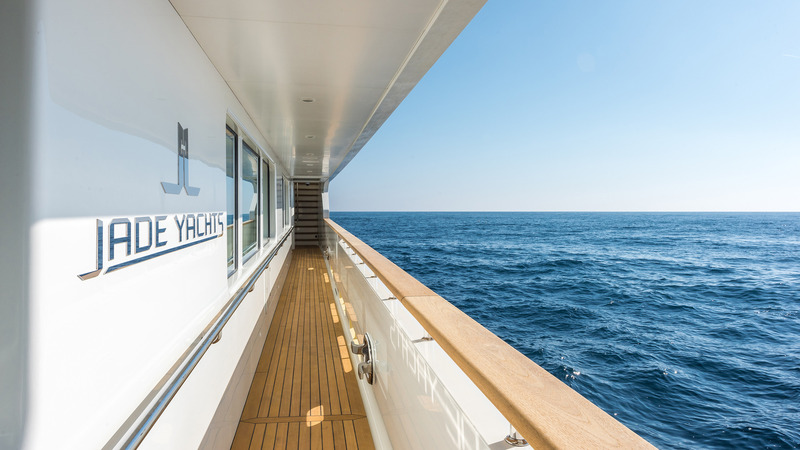 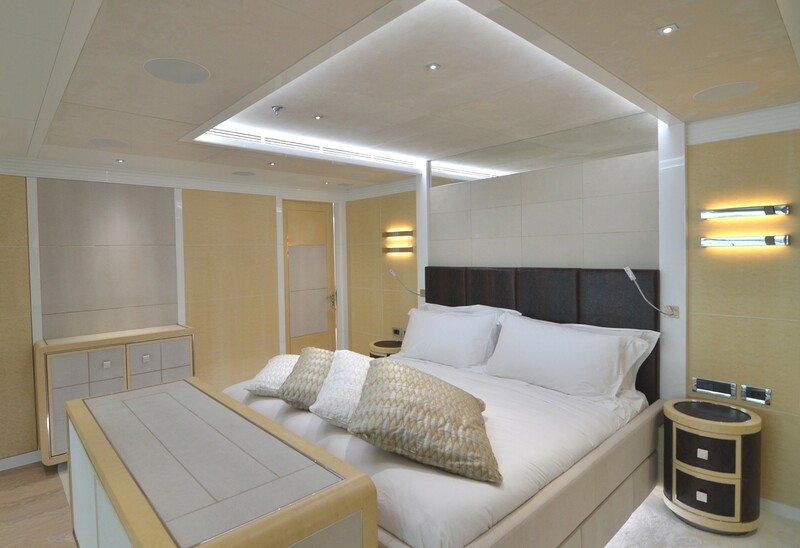 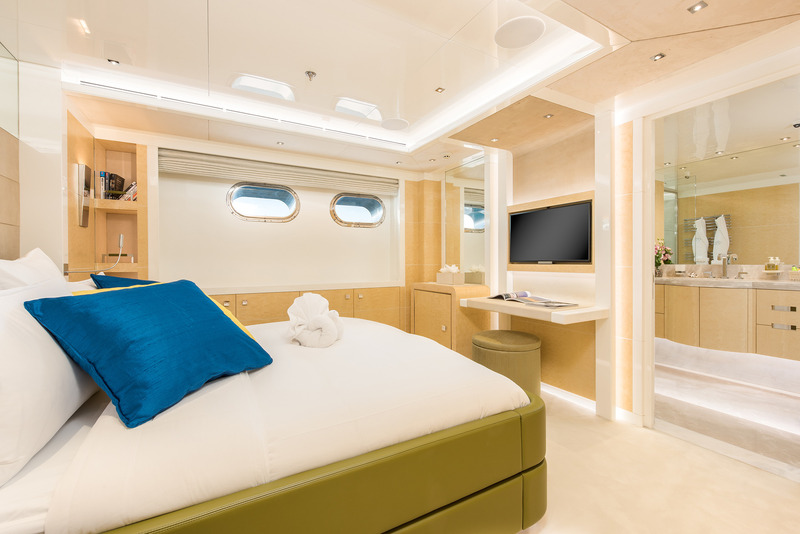 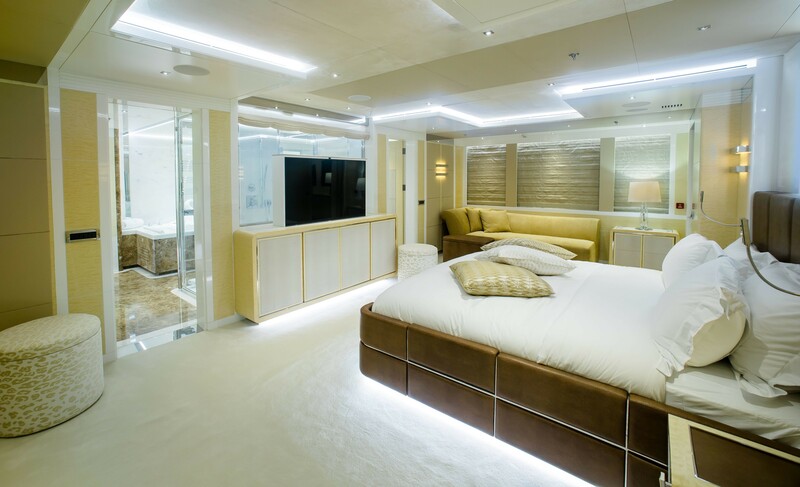 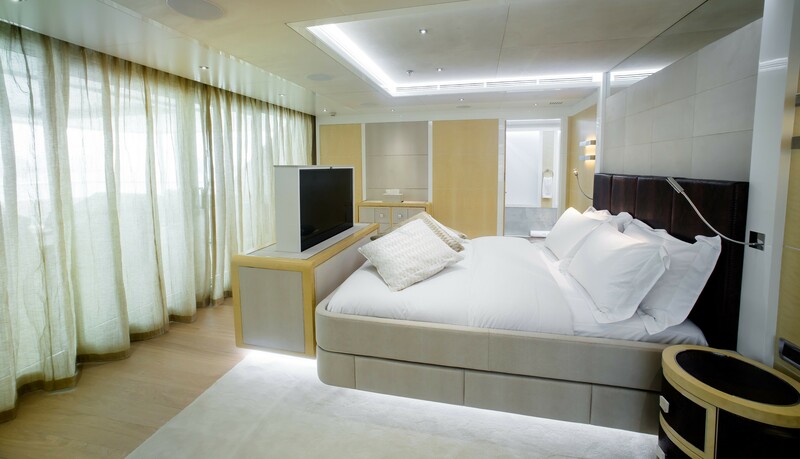 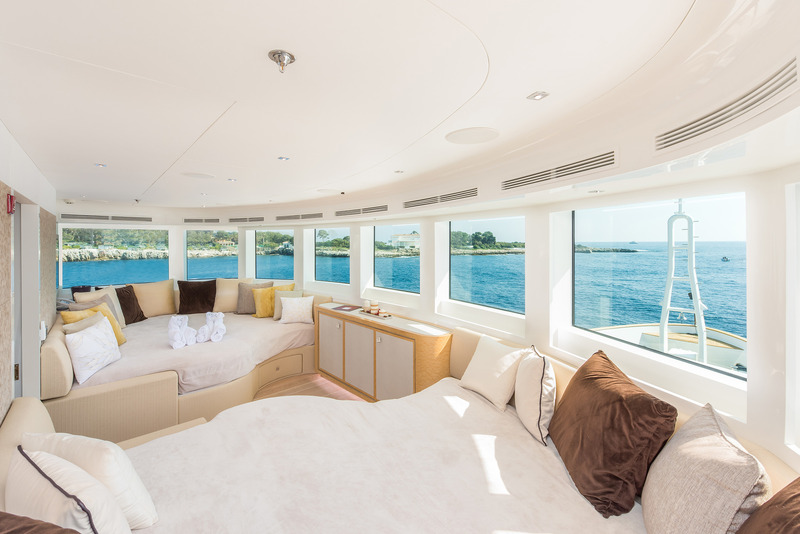 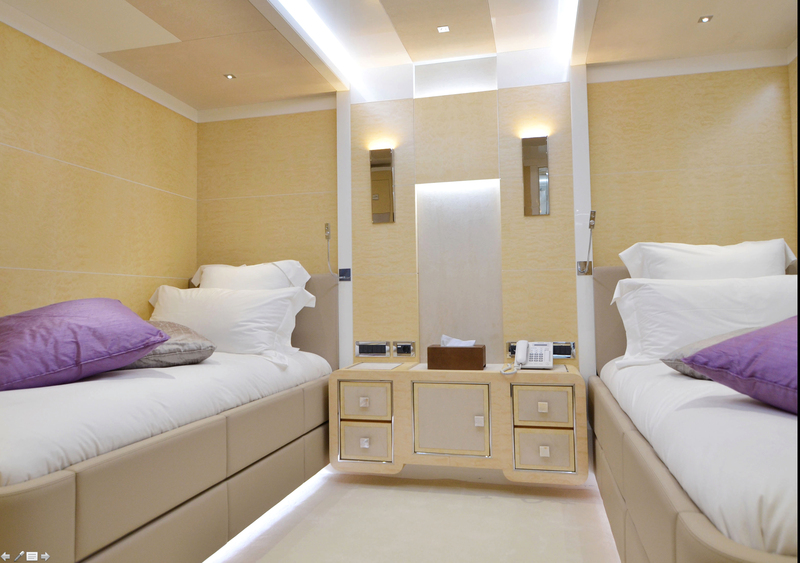 On the upper deck, the second master cabin is full beam of the yacht, with a large private study / meeting lounge and center lined king size bed. 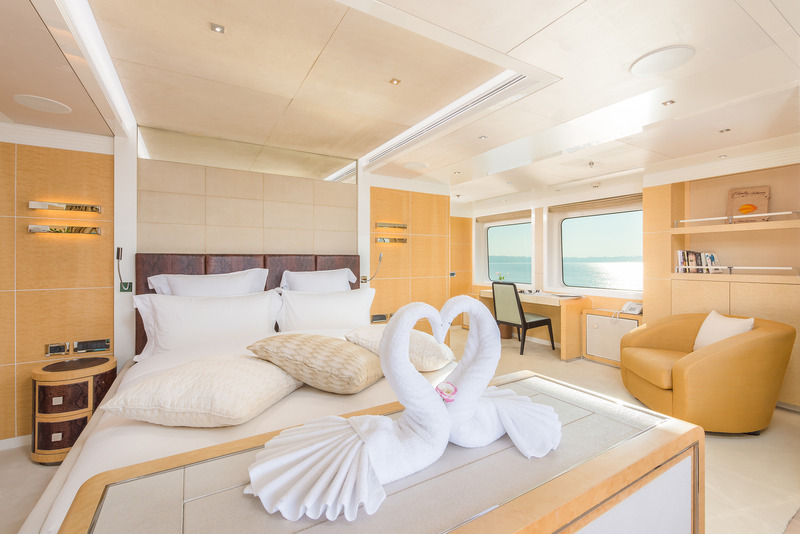 The lower deck offers 2 VIP cabins and 2 twin cabins. 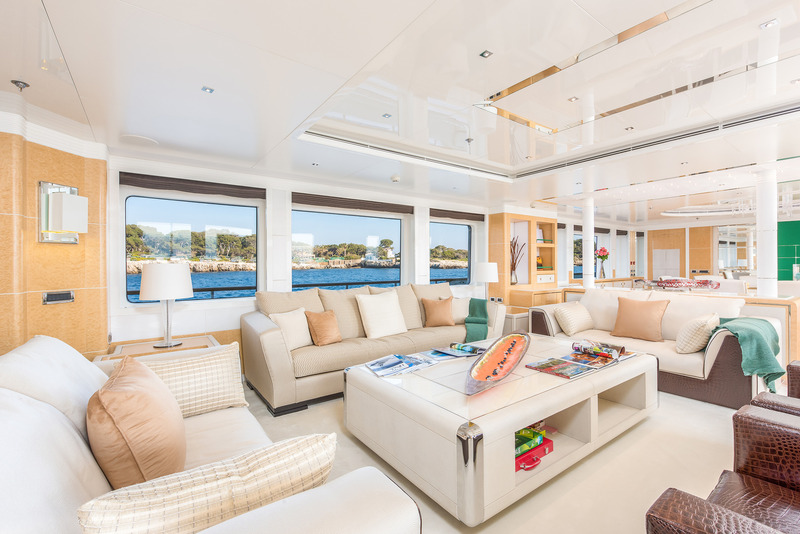 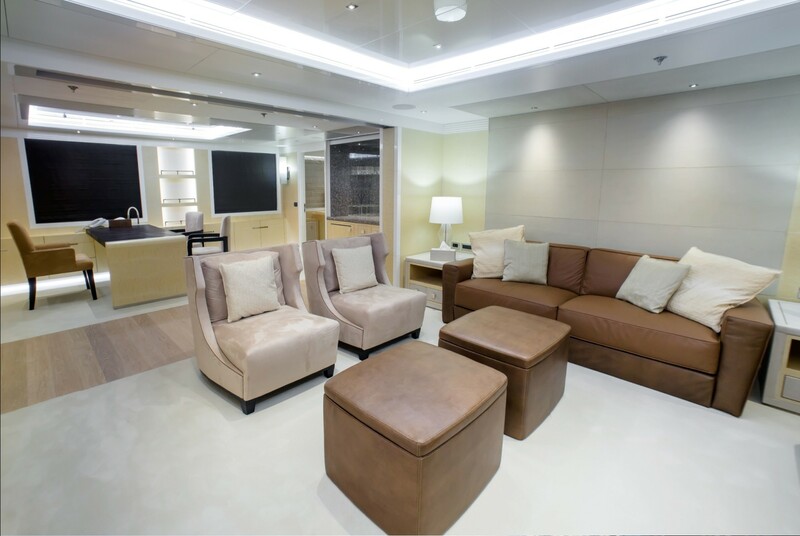 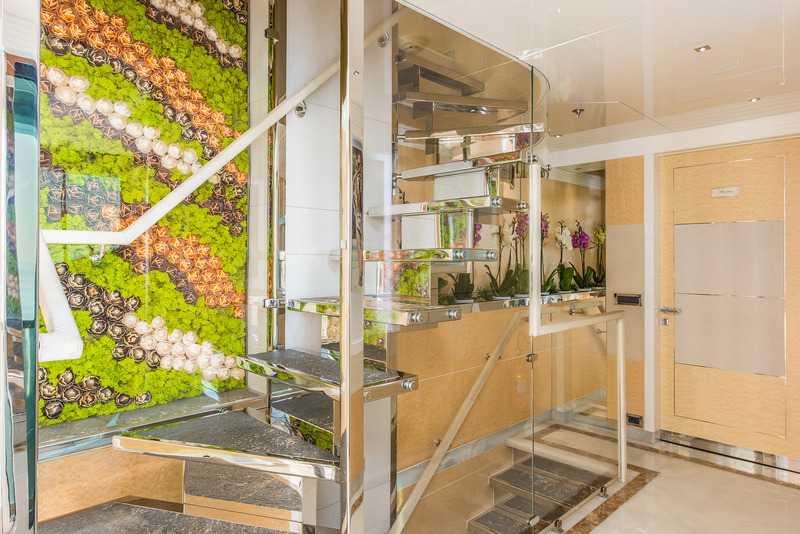 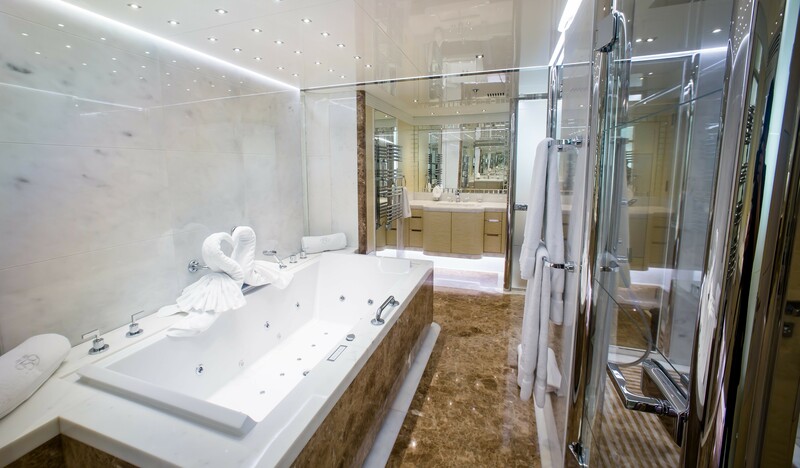 All cabins aboard the motor yacht JADE 959 are spacious, light and airy featuring the fine finishing touches and furnishings seen throughout.